Canadian Earth Science for @PMHarper 11 – Dino Hunt! Posted today, February 12, the 206th anniversary of Charles Darwin’s birth and just in time for tomorrow, another #FossilFriday and another day to watch Dino Hunt! Formation, Edmonton, Alberta, Canada) as a case study. Canadian Journal of Earth Sciences, v. 51, p. 987–991. 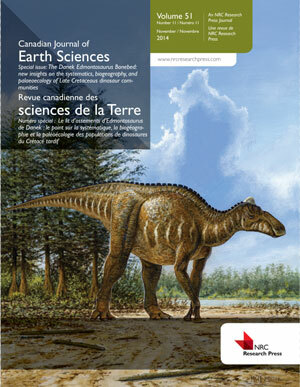 Cover of the December 2014 special issue of the Canadian Journal of Earth Sciences, dedicated entirely to the Danek bonebed. If you live in Canada and have TV, you should watch it: Dino Hunt! Every Friday evening at 9 pm Eastern, that is – if your cable provider has the History Canada channel (I bet 24 Sussex Drive in Ottawa does). Whether you do or do not have TV, check out the Dino Hunt website, as it is chock full of fascinating information and you get to meet Canada’s dinosaur hunters, i.e. paleontologists. Earth Scientists owe a lot to Michael Crichton for penning “Jurassic Park” in 1990 and subsequently to Steven Spielberg for making the movie in 1993. The popularity of dinosaurs, already substantial, instantly skyrocketed and continues to do so. At least that aspect of earth science can bask in a reasonable amount of public interest and understanding. And who wouldn’t be awe-inspired by these magnificent beasts that once roamed our planet in great hordes only to become extinct suddenly, most likely after a 10km-diameter asteroid slammed into what is now Mexico’s Yucatan Peninsula? For a good 200 million years, from about 220 to 65 million years ago, they were the dominant land animals on our planet. With the exception of the feathered Theropods, which evolved into birds as we know them today, all dinosaur families went extinct on that fatal day 65 million years ago. Dinosaur evolution and demise. Image source here. Canada has world class dinosaur fossil sites. Most sites are in Alberta, but there are also sites in Saskatchewan, British Columbia and Nova Scotia. Dinosaur Provincial Park in Alberta is one of Canada’s 17 UNESCO World Heritage sites. Close by is the Royal Tyrrell Museum, which hosts magnificent dinosaur displays and also functions as a research centre. The small community of Tumbler Ridge, British Columbia acquired Global Geopark status last year because of its rich diversity and extent of dinosaur trackways (see my earlier post on Canada’s Geoheritage here) and the world’s oldest (and tiniest) dinosaurs are found near Parrsboro, Nova Scotia, where the Fundy Geological Museum does them justice. And then there is the Danek Bonebed, smack in the middle of the city of Edmonton. It was discovered in 1989 by an amateur fossil collector, initially excavated by the Tyrrell Museum and closed up again in 1991. It was reopened in 2006 by the University of Alberta’s Laboratory for Vertebrate Paleontology, which is led by world-famous paleontologist Dr. Phil Currie, who is part of the department of Biology (paleontology straddles the earth and life sciences and you might therefore find academic paleontologists in both biology and geology departments). The “Currie-stable” (if I may) has produced and continues to produce highly respected paleontologists, several of whom also feature on Dino Hunt. What is special about the Danek bonebed is that is serves as the basis for a University field course, as a citizen science program (more than 4000 hours of volunteer service have been donated to its excavation) and as a prime public education site as well as an ongoing research location. 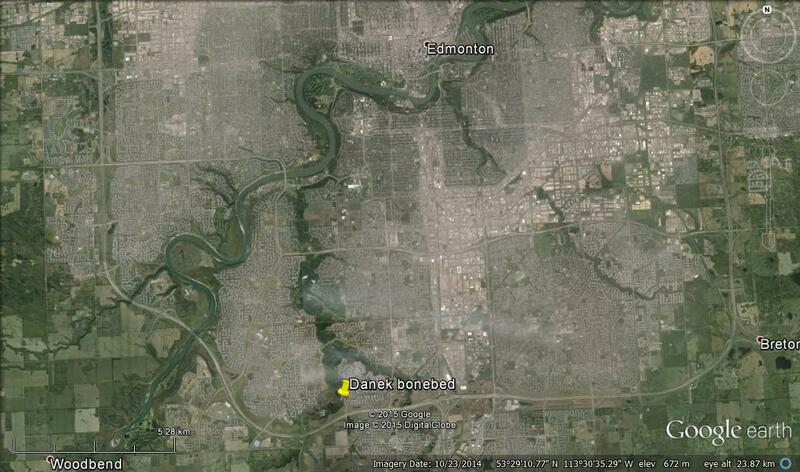 Location of the Danek bonebed, exposed in a creek that is part of the Mactaggart Sanctuary in the city of Edmonton. The Danek bonebed is the subject of the December 2014 special issue of the Canadian Journal of Earth Sciences. There are 12 articles in this volume. Its title is the same as that of the introductory article by the issue’s editors, which I cite below. 1. this paper is a perfect demonstration of how the daily practice of science is often mind-crushingly boring. Paleontology is about collecting. In order for a collection to be worth anything to proper and further investigation, in a manner that will make it a worthwhile to the global understanding of evolution, the collected bits must be catalogued and documented in great detail. Where was this little bone found exactly? What number does it get? What sort of a bone is it? What species did it belong to (ok, they know that here, because almost all of the bones in the Danek bonebed belong to Edmontosaurus regalis individuals, but still)? Talk about tedious. All in the name of science. 1. The paper reminded me of an important learning moment in my own experience: some 25 years ago, the office next to me was occupied by a PhD student in vertebrate paleontology. His subject was a cave on the island of Sardinia, on the floor of which were thousands of antelope bones. The question was whether those antelopes died a natural death or whether early humans used the cave as a place to deposit their hunting caches. How would one be able to tell? The student had mapped the bones on the cave floor in great detail and then sought help from geophysicists. Geophysicists were then just beginning to write programming that would enable recognition of patterns on seemingly chaotic seismic lines. This programming was applied to the antelope bonebed to find out whether its bone distribution was random (i.e. the result of a mass dying of natural causes) or – in some way – orderly (i.e. the result of humans depositing bones). To be honest, I don’t know what the outcome of that research was, but I have never forgotten how what was then brand new technology being developed for oil and gas exploration was applied to a completely different research question. That happens often, but it’s important to know that it does, in case someone has yet another cynical question about what this bit of academic research is actually good for? The same is the case here. GIS technology (GIS stands for Geographic Information System), is information technology in a spatial context. The technology is less than 50 years old, was pioneered by British-Canadian Roger Tomlinson, and it continues to develop rapidly. It was designed for statistical mapping but quickly became used for investigating a plethora of other questions that require insight in spatial distribution of phenomena. And so, after an immense amount of precise taxonomy and catalogueing, a researcher can open the Danek GIS-file, type in ‘femur’ in the search window and up pops the image below, highlighting every bone (within a precisely mapped quadrant) that is a femur. If the researcher then clicks on a particular femur, the database opens showing her all the parameters of that particular bone (length, amount of damage, from a juvenile or an adult, etc. etc.). This is an incredible tool for current and future researchers, a fantastic application of new technology in the still developing field of evolutionary biology = paleontology. 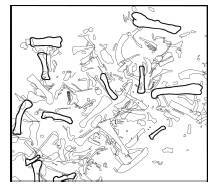 An example of results if the researcher searches for ‘femur’ (bold black bones in the image). Figure 3 from the article by Bramble et al. Early earth scientists, Charles Darwin among them, researched fossils intensely, making paleontology one of the corner stones of earth science. Nearly two hundred years later, the field is still developing rapidly using brand new technology and our understanding of evolution is growing with it. Burns, M.E., C. Coy, V.M. Arbour, P.J. Currie and E.B. 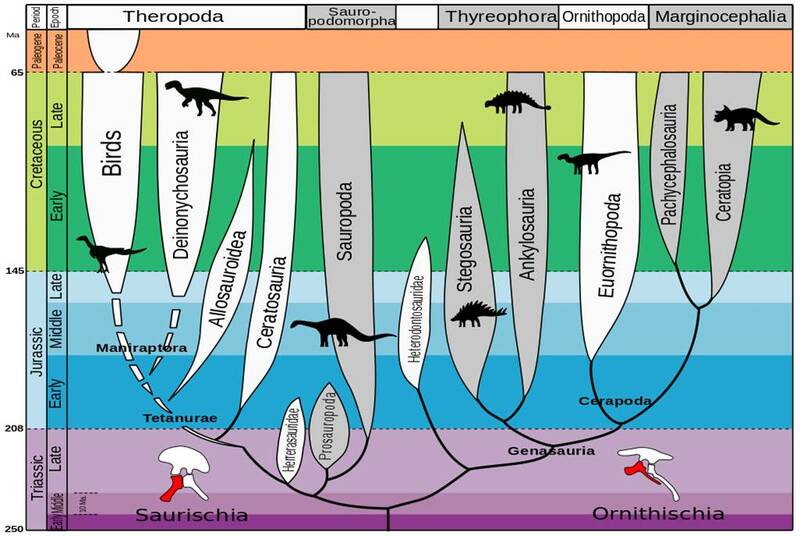 Koppelhus, 2014, The Danek Edmontosaurus Bonebed: new insights on the systematics, biogeography, and paleoecology of Late Cretaceous dinosaur communities. Canadian Journal of Earth Sciences, v. 51, p. v-vii. Figure 1. Winter ice on the salt marshes of Minas Basin photographed from Wolfville, Nova Scotia, March 1, 2007. View to the North. What is an estuary? An estuary is a bay with an open connection to the sea. Rivers flow into an estuary, mixing with sea water, resulting in a brackish water environment. All estuaries that we see today came into existence after the rapid sea level rise that marked the end of the last ice age ca. 12,000 years ago. If sea level stays stable long enough, estuaries eventually completely fill with sediment (pushing the shoreline seaward). There is ample evidence of filled estuarine sedimentary sequences in the geologic record and while they all share commonalities, they are also all unique and different from each other because the local conditions were different at their time of formation. In our present-day world, estuaries are important habitats. Healthy estuaries are surrounded by tidal marshes, the extent of which depend on the estuary’s tide range. Tidal marshes generate lots of primary nutrients, mostly carbon (from marsh vegetation and dead critters), upon which feed fish larvae and other creatures all the way up the food chain. Estuaries are fertile places and therefore people like to live around them. What I want to show you are some of the utterly amazing features of the estuary in my back yard: Minas Basin, an arm of the Bay of Fundy, boasting the highest tide range in the world, up to 18 meters between high and low tide. And despite being located at 45N, Minas Basin also experiences really serious winter ice conditions, which influence its sediment and nutrient balance. The estuary is bordered by soft shale and sandstone cliffs, which erode rapidly under the attack of tides and winter ice. 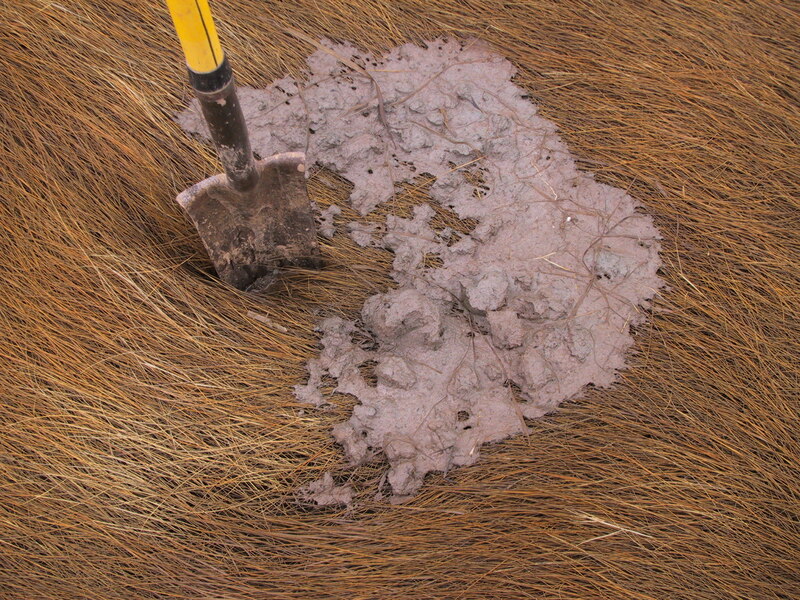 The land surface is otherwise covered in thick, soft and easily erodible glacial deposits. The only other estuary in the whole world that compares somewhat with Minas Basin is Knik Arm, Alaska. So they are both pretty unique. Figure 2. The upper Bay of Fundy photographed by astronauts in the International Space Station on Feb 28, 2007 (image source here). 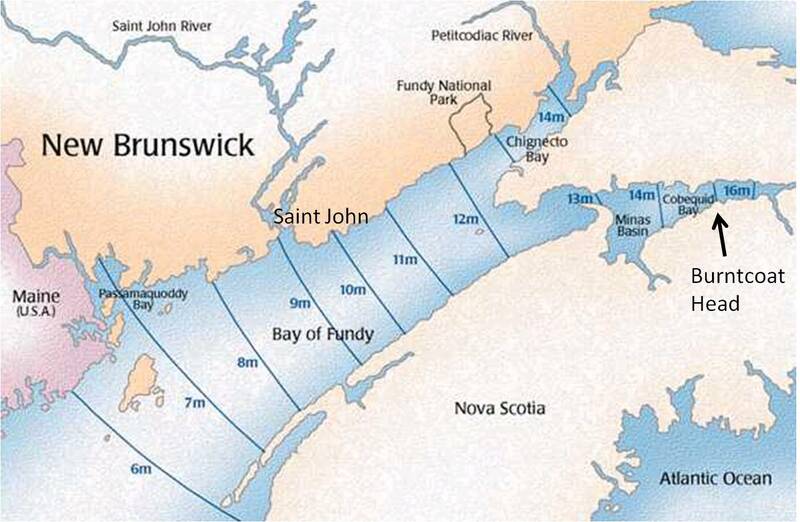 Inset: Bay of Fundy and its tide ranges in meters. The red square indicates the coverage of the ISS image. The white streaks in Minas Basin are ice rafts, stringing along on the outgoing currents (the image was taken 3 hours after high tide). Click on image to increase size. Figure 3. Ice rafts on the outgoing tide in Minas Basin, March 1, 2007, a day after the ISS image was taken. The headland in view is Cape Blomidon, the entry to Minas Basin is behind it. View to the NW. Photo taken from a small aircraft (that was a very cold flight!). The Bay of Fundy itself almost never sees ice rafts, but its two extremities, Minas Basin and Cumberland Basin, generally see them every year. The reason is salinity. Minas Basin and Cumberland Basin are less saline than the Bay of Fundy itself because of the rivers flowing into them. Fresh water freezes at 0oC. Seawater, which has an average salinity of 35 ppm (parts per million), freezes at -2oC. That seems only a tiny difference but it makes for big differences in the field. Figure 4. Predicted day-time high tide range in Minas Basin for the year 2007 (there are two high tides per 25 hours, but for visual clarity, only the day-time high tide is included here). Vertical scale is in meters: zero is mean sea level. The horizontal scale represents the days of the year, all 365 of them. Note that there is a difference of about 9 meters between the lowest and the highest high tides during the year! The orange line indicates the approximate elevation of the high supratidal marsh. The blue accolade indicates the period of potential winter ice conditions. The extreme high tides bulges during the first and second half of the year are the months with perigean spring tides. Figure 5. Observed mean temperatures (lower bars, data source here) and predicted day time high tide range for Minas Basin, March 1 through 31, 2007. Vertical scale of top half is in meters, vertical scale of bottom half is in degrees C. The “Ice Window”, i.e. 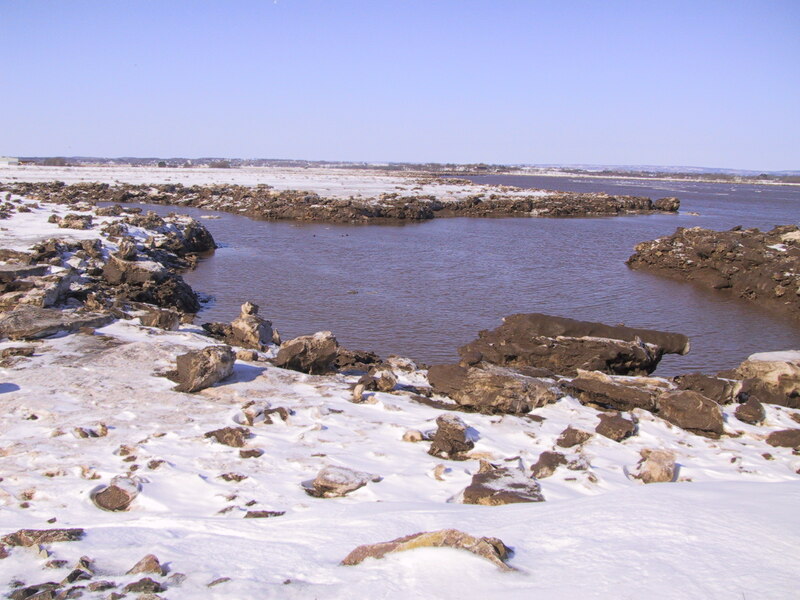 the period during which ice rafts were able to form, lasted from mid January through mid March that year, but the high tide flooded the marsh only for a few days in late January and February. By late March, when the tides flooded the marshes again, most ice rafts had melted significantly. When winter ice begins to form, it first forms closest to the shore on the marshes and on the edges of the tidal creeks near the river mouths, where the salinity is lowest (for simplicity sake, I’m ignoring supercooling here). Once a smaller ice raft is formed, it grows – with more ice, but also with frozen mud and dead vegetation. As the incoming tide floods the channels, ice is nudged up the sides of the tidal channels until the water starts spilling onto the marsh. The tide chart (Figure 4). shows that the marsh is rarely completely flooded: less than 10% of all the high tides in a year flood the marshes completely and some of those happen in winter (blue bracket on Figure 4). Theoretically, at every higher high tide, the ice rafts are floated up further to the marsh interior but this works only for a limited time because the rafts become very heavy: they may contain as much as to 35% sediment by weight, as a result of which they become frozen to the marsh surface and so get stranded on the tidal creek edges, as can be seen in figures 6 and 7 below. Figure 6. 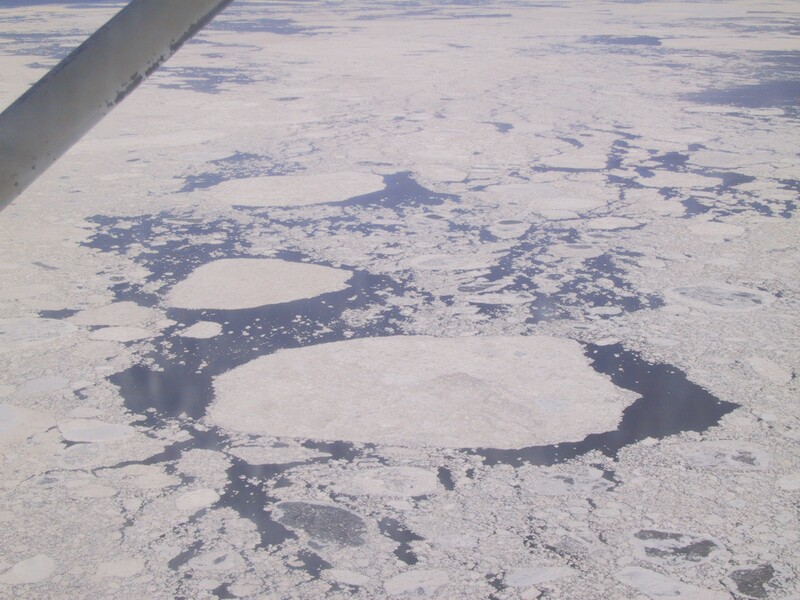 March 1, ’07: Ice blocks (dirty-ish blobs) concentrated on the edges of the tidal creeks as seen from a small aircraft. Width of view ca 200 m.
Figure 7. March 1, 2007. 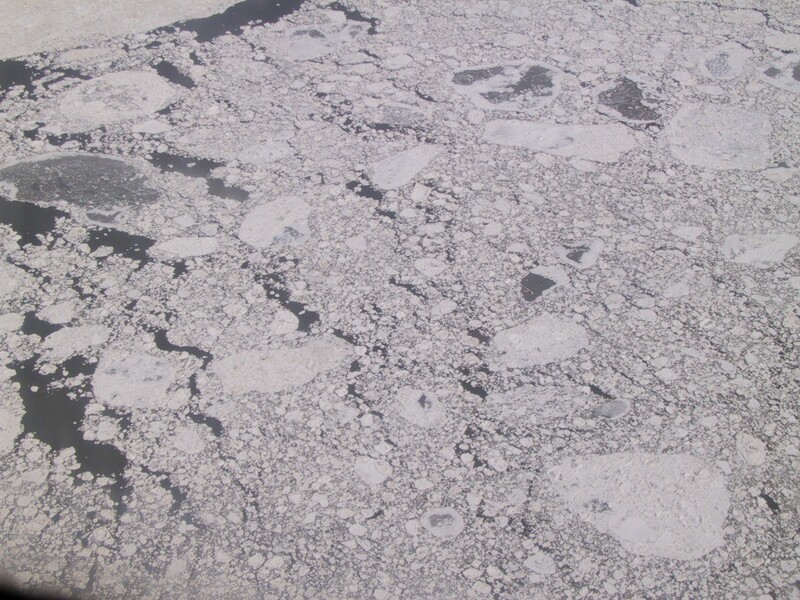 Left: ice blocks concentrated on the edges of the tidal creeks, same area as figure 6. Right: multigenerational ice raft incorporating sediment and dead vegetation. Any ice that doesn’t freeze to the marsh surface, floats around on the tidal current and forms amazing patterns. Figure 8. 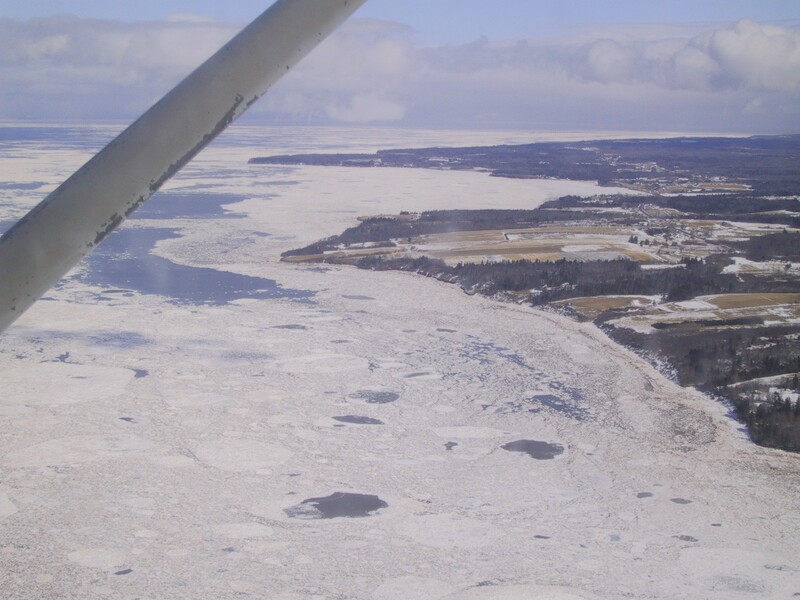 A variety of freely floating ice rafts in Minas Basin, March 1, 2007, as seen from a small aircraft. By late March temperatures start to rise and the great melt begins. It may take up to two weeks for the big blocks to melt completely. So here is the interesting question: how much do the typical winter ice conditions contribute to the sediment budget so that the marsh can maintain elevation at Mean High Water level? To what extent owe tidal creeks their stability to their banks being frozen solid for 2 months? Are these questions relevant? Yes, they are: tidal power generation is coming our way (see my earlier post on Nova Scotia tidal power development here) and without better numbers, modeling the effects of large-scale tidal power on the estuary remains guesswork. Ice is a concern for tidal power generation because of the possibility that heavy sediment-laden ice rafts may become detached from the marsh, barrel through the water below the surface and become cannonballs for tidal turbines. The Nova Scotia government commissioned a study on winter ice conditions about 10 years ago (Saunders and Baddour, 2006) but luck had it that 2005-6 was a winter without any ice, so these authors had to rely on literature. A lot of excellent research on sediment budgets and marsh dynamics is carried out, notably by Dr. Paul Hill, Dr. Danika van Proosdij, and Dr. Brent Law, but winter ice is difficult to research because unpredictable and while they both acknowledge the importance, they haven’t been able to turn their attention to it yet as much as they would like. 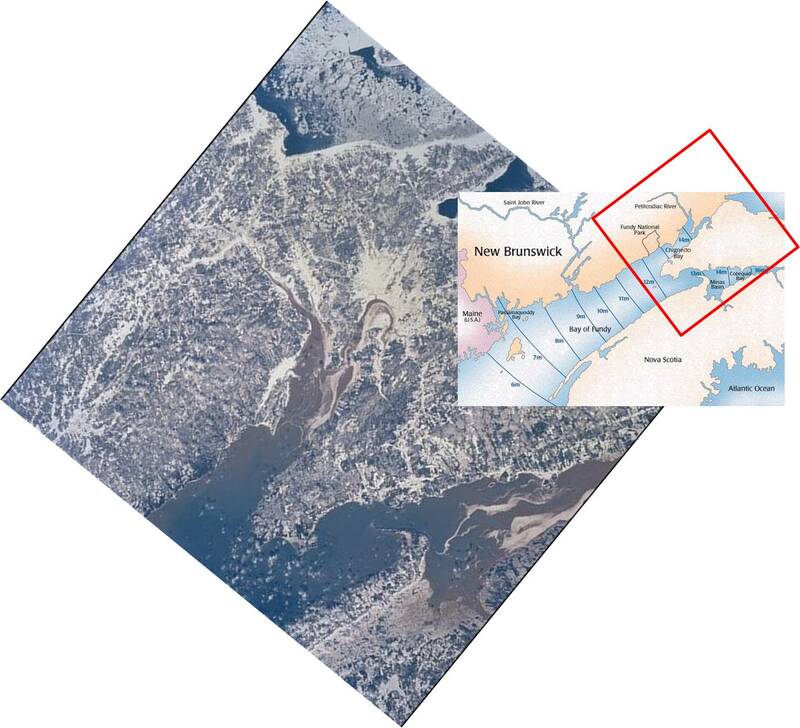 Kosters, E.C., 2007 (abstract), Tides, Sediment and Ice: wreaking havoc with in stream tidal power development in Minas Basin? Program and Abstracts, Atlantic Canada Coastal and Estuarine Science, Society Conference, Sydney, NS. van Proosdij, D., Milligan, T., Bugden, G. and C. Butler, 2009, A tale of two macrotidal estuaries: different morphodynamic response of the intertidal zone to causeway construction. Journal of Coastal Research, SI 56, 772-773. ISBN 0749-0258. Halverson, G.P., F. Poitrasson, P.E. Hoffman, A. Nédélec, J.-M. Montel and J. Kirby, 2011, Fe-isotope and trace element geochemistry of the Neoproterozoic syn-glacial Rapitan iron formation. Earth and Planetary Science Letters, v. 309, p. 100-112. The MacKenzie Mountain front in Canada’s NW Territories as seen from the river plain near Norman Wells. Image from Google Earth (Panoramio). The fieldwork for this paper was carried out in these mountains. Iron is Earth’s most common element by weight. There is so much of it that a compass needle (yes, also the one in your smartphone) lines up with the earth’s magnetic field. We also know that Iron changes form, because we are familiar with rust. Rust is oxidized iron and oxidation happens when Ferrous Iron (Fe2+) is exposed to the atmosphere (rich in oxygen) without being protected by some sort of coating. Under the burning influence of atmospheric oxygen,Ferrous Iron it changes to Ferric Iron (Fe3+) and turns red. A lot of rocks are rust-coloured because of this reason. Iron also has one unstable isotope: 57Fe. The amount of this isotope varies every so slightly depending on oceanic and atmospheric chemistry. This change can tell us something about conditions in the past, if we know the age of the rocks. This article uses that knowledge to unravel conditions about 700 million years ago. The authors of this article are Snowball Earth (official site here) experts: their research focuses on testing the hypothesis that earth around this time experienced a global ice age during which continental ice caps covered most of the planet as far as the equator. The most obvious evidence for Snowball Earth is the ubiquitous presence fossilized glacial till in rocks of this age. Till (another word is diamictite) is the chaotic sedimentary mass that forms beneath a continental ice cap: it consists of pulverized rocks and pebbles in hard clay. A dead give-away of a former ice cap over the ocean (such as Antarctica’s Ross Ice shelf today), is the presence of dropstones in marine sediments. Dropstones are rock fragments, eroded from underlying bedrock by the icecap, transported by that same ice cap and subsequently melted out, fallen to the sea floor below and incorporated in the sediment. The authors of this paper studied a sequence of rocks known as the Rapitan Group in the Mackenzie mountains in the Northwest Territories (latitude 640N). The Rapitan Group is ca. 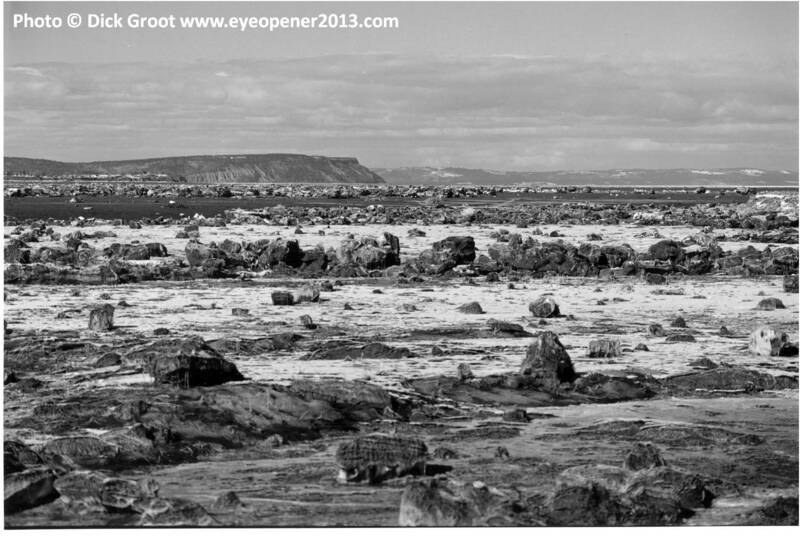 700 million years old and shows evidence of ice age conditions, such as till and dropstones. When these sediments were deposited, this part of earth was situated at about 180S! Not a latitude where glaciers occur today or in our more recent Ice Ages when they reached as far as about 400 (North or South). 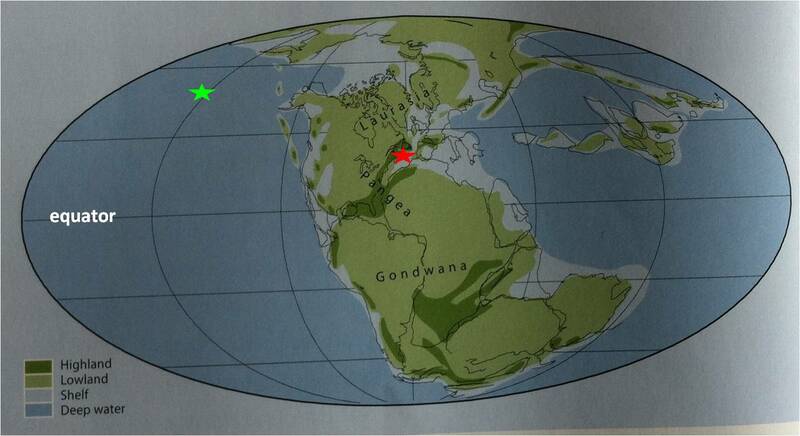 Not only show the rocks of the Rapitan Group evidence of glacial conditions, they are also unusually enriched in Iron. Left: A dropstone in iron-rich sediments of the 700 million year old Rapitan Group, Mackenzie mountains, NWT (pen for scale below the dropstone; photo from article). Centre: a core with 20,000 year old sediments and dropstones from the Orphan Basin offshore Newfoundland for comparison (vertical scale in centimeters) (Image Source Tripsanas et al, 2007). Right: finely laminated Iron-rich marine mudstones and siltstones from a different interval in the Rapitan Group. Sedimentary rocks with this much Iron are called ‘Banded Iron Formations’ (BIF). The most widespread BIFs are much older, between 2.4 and 1.8 billion years and they represent the bulk of the world’s iron ore deposits. Those earlier BIFs are thought to have originated biologically: massive Iron fertilization of the world’s oceans through ocean floor vents caused equally massive blooming of cyanobacteria, which were almost the only living organism at the time, fixing the iron in these bacterial sedimentary rocks. In the course of that process, earth’s atmosphere got its first major oxygen injection because cyanobacteria are photosynthesizers (if you think this is one of these completely irrelevant ivory tower types of research, I’m happy to remind you of this ocean iron fertilization controversy). But the BIFs of the Rapitan Group are different than those much older BIFs. The BIFs of the Rapitan Group were deposited in greater water depths and, unlike the older BIFs, their origin is linked to ice caps (dropstones and the like). Why suddenly all this iron-fixing again after it had ended 1 billion years earlier? Were Snowball Earth conditions the cause of this return of massive iron fixing? Ice caps covered most of Earth during this time and the remaining ocean waters were cold. Iron was supplied to the oceans by interaction between ocean water and the ocean floor. Because ice covered most of the water surface, remaining ocean waters didn’t circulate or overturn much, so that any deeper ocean waters (just below the thin, oxygenated photic zone) were oxygen-deprived. The underside of the ice caps would nevertheless melt in contact with ocean water and send dropstones and occasional gravity flows (high density currents that hug the bottom) to greater depths, interfingering with the deeper finely laminated silts and muds. The Iron that was released from the ocean floor precipitated either as a result of fixing by bacteria that thrived in low-oxygen conditions or as a result of abiologic oxidation: the research is inconclusive about which process was responsible. The lower part of the Rapitan Group sequence is dominated by intervals that show finely laminated iron-rich mudstones and dropstone-dominated intervals. These were deposited and precipitated on the bottom of the sea under oxygen-poor conditions. The 57Fe isotope has low values. Upwards these abruptly make place for tills deposited below a continental ice cap and at this boundary the isotope 57Fe shows a marked increase, which must be explained by an increase in the amount available oxygen. It’s difficult to interpret element cycling conditions on our planet this long ago because it was such a different place from today: bacteria were the only life forms, the land was barren. And yet the authors have found a modern analogue to the strange conditions that made deposition of the Rapitan Group rocks possible. 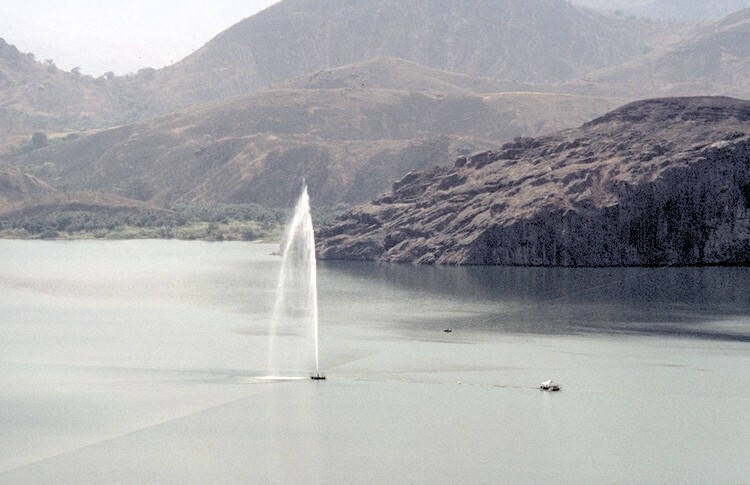 The modern analogue is Lake Nyos, in Cameroon. I was at work in the summer of 1986 when news spread that a volcanic eruption in Cameroon had killed nearly 2000 thousand people and a lot of cattle. A few days later (it was the pre-digital age), it turned out that this catastrophe had not been caused by a volcanic eruption. Lake Nyos is a deep crater lake of an inactive volcano. Because it is located in the seasonless tropics, the waters of this lake don’t overturn and hence the lake is anoxic and rich in carbon dioxide below the thin oxygen-rich surface layer. When a small landslide slid into the lake, oxygen-rich surface and anoxic deeper waters suddenly became mixed, allowing previously locked up toxic gases to escape over the crater edge and down the slope of the volcano (carbon dioxide is heavier than air and hugs the ground), suffocating people and cattle in its way. A unique and disturbing disaster (read more about it here). In order to prevent such a catastrophe from happening again, the lake is now ventilated by a metal pipe through which deep water is pumped to the lake surface. The pipe delivers Ferrous Iron to the surface where it immediately oxidizes. At the anoxic-oxic boundary, the same change in 57Fe isotope is detected as in the Rapitan Group rocks. This observation strengthens the interpretation that conditions changed from anoxic to more oxygenated 700 million years ago. This is challenging research. Not only does it require travel to the remote Mackenzie Mountains, where you must sample inaccessible sections of rocks and then store and transport the samples without polluting them, you must also carry out very complex chemical analyses. Samples were shipped all over the world to specialized laboratories. The authors go to great lengths to explain all the ifs and buts and potential pitfalls of this kind of work and how they avoided them. Hats off. This paper is an elegant contribution to understanding the incredibly intricate and complex cycling of elements and nutrients on our planet over time. A small trigger suddenly caused the deposition of massive iron deposits during an utterly exotic global glaciation. Cause for reflection on our role as humans and the potential pitfalls of human intervention in system Earth. Tripsanas, E.K., D.J.W. Piper and K.A. Jarrett, 2007, Logs of piston cores and interpreted high-resolution profiles, Orphan Basin. Geological Survey of Canada Open File 5299, 339 pages. The Angular Unconformity (U) at Nova Scotia’s Rainy Cove, separating intensely folded and faulted early Carboniferous shales and sandstones of the Horton Group (labeled 1 below the unconformity) and gently inclined, undeformed sandstones and conglomerates of the Wolfville Formation (2) at Rainy Cove, Nova Scotia. A New Year, a new blog banner! My banner pictures are from around Minas Basin, a stunning estuary on which shores I live (this to my daily surprise and gratitude). My previous banner picture and associated blog post is here. 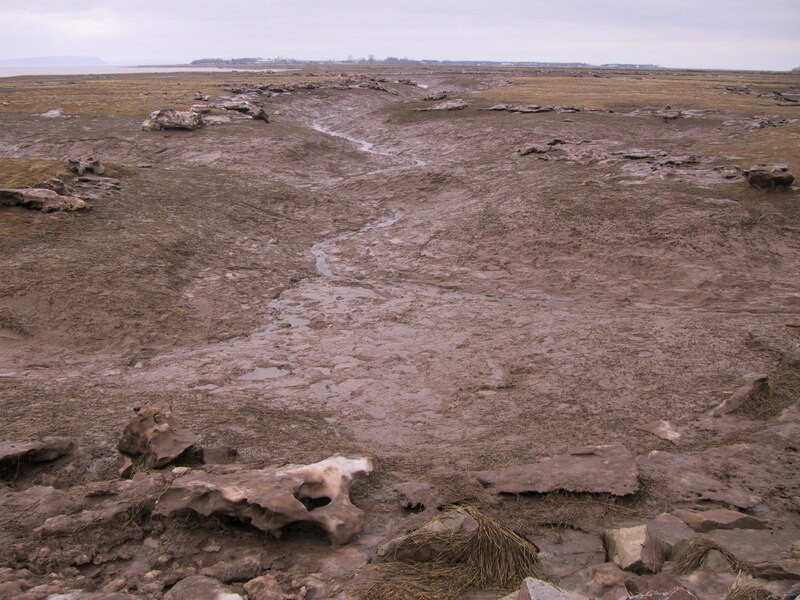 The unconformity in this banner photo is exposed along the eastern shores of Minas Basin (location image at the end of this post). It is one of my favourite places to explore along these shores: there is so much to see here! Not only in the exposed cliff face, but also on the tidal flats that extend for several kilometers west of the cliff for about 2 hours (during low tide). The contrast between the two units below and above the Unconformity at Rainy Cove. Left: intensely folded organic-rich shales and sandstones of the lower Carboniferous Horton Group (ca 340 million years old, unit ‘1’ in top photo). The image is about 2 x 2 meters. Right: massive, undeformed sandstones and conglomerates of the Wolfville Formation (unit ‘2’ in top photo – person for scale). What is an unconformity, how does it come about and why is that interesting or even relevant? This is not an exhaustive coverage of the subject, so here I will discuss only the type of unconformity we see here, the “Angular Unconformity”. 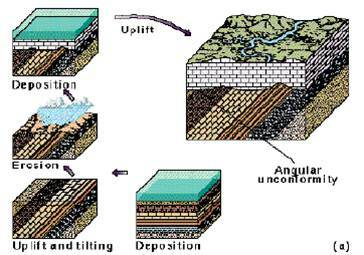 How an Angular Unconformity comes about (image source here). First (central panel, bottom of figure) sediments are deposited in a sea. The different colours and patterns indicate different kinds of sediments, such as sandstones and limestones. Next (lower left hand corner), the sediments, having become lithified, are uplifted and tilted during a mountain building episode. 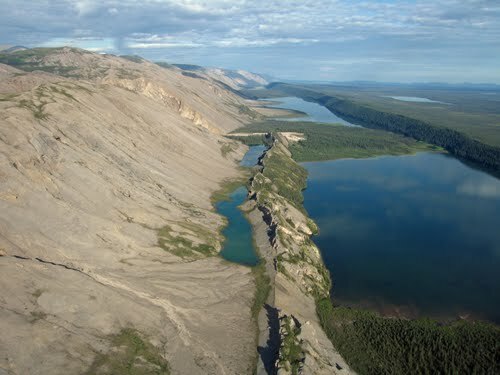 During and after uplift, the mountains are eroded down (central left hand panel) until the land surface is once again the bottom of a sea and new sediments are deposited on top (upper left hand panel). When those sediments are once again lithified and uplifted during a subsequent tectonic event, the end result is two juxtaposed rock formations, each with a different orientation (largest panel). There may be millions of years between the time of deposition of the first and the second set of rocks. The surface between the two formations (which shows as a line in a two-dimensional rock face) is the Angular Unconformity. The Angular Unconformity marks a gap in time from which rocks are missing at the outcrop. A. 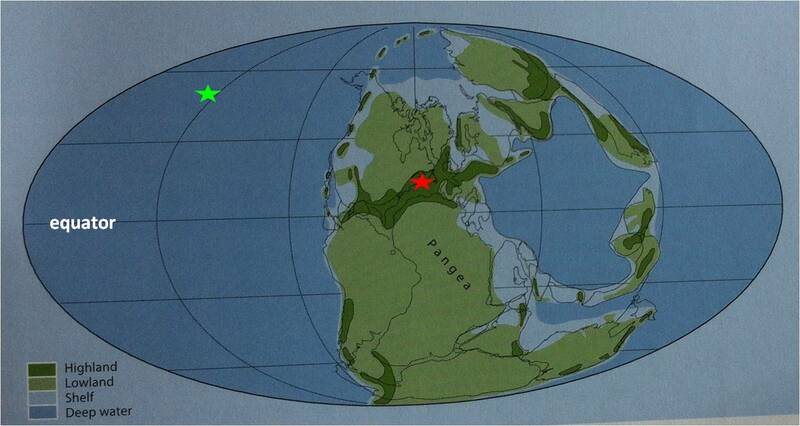 During the early Carboniferous, about 340 million years ago, Nova Scotia (red star) was located in a southern tropical latitude. 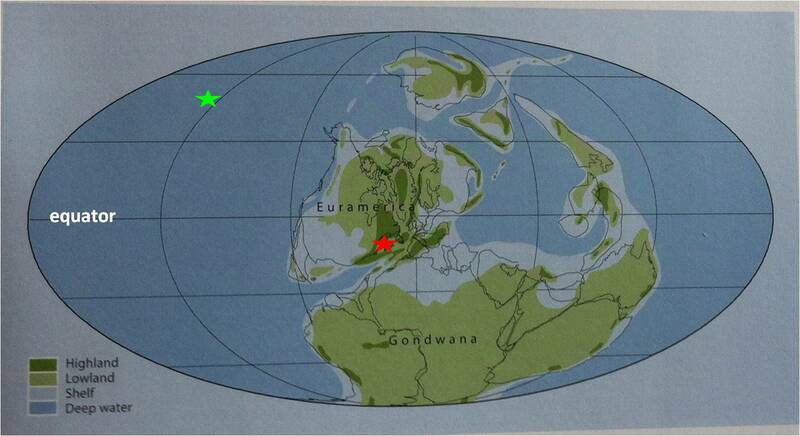 Rich tropical forests bordered a shallow tropical sea, which was becoming narrower as the continents fused together to form the supercontinent Pangea (the green star is where Nova Scotia is located today). Thick piles of sediments of what we now call the Horton Group, consisting of organic-rich shales and sandstones, rife with unique fossil assemblages (especially at Blue Beach and Joggins), were deposited during this time. Image adapted from The Last Billion Years. B. By the late Carboniferous, ca. 305 million years ago, Pangea had formed and the sediments from that shallow, tropical sea had become sedimentary rocks. They were folded and faulted during the mountain building episode (called the Acadian orogeny) that was the result of the collision of these pieces of continent. Note that Nova Scotia is now solidly at the Equator. Image adapted from The Last Billion Years. C. By the Permian, about 255 million years ago, things look fairly similar to the late Carboniferous, but Nova Scotia has yet again inched further north. It is still ‘highland’ and is eroding and shedding sediment to regions further away. Image adapted from The Last Billion Years. D. By the late Triassic, ca. 215 million years ago, a crack is appearing in Pangea because of early break-up of the supercontinent (this process will eventually lead to the formation of the Atlantic Ocean). Nova Scotia is now at 150 N, the latitude where deserts occur (similar to today’s situation). The former highlands are eroding by sending alluvial fans off into the newly formed low area. These are the sedimentary rocks of the Wolfville Formation, which overly the unconformity (unit 2 in the top photo). Image adapted from The Last Billion Years. The Angular Unconformity at Rainy Cove represents a gap in the geologic record, a period of ca. 135 million years (between early Carboniferous and late Triassic). In other words, there are no rocks of 340-215 million years old in this area. Sediments of this period exist elsewhere: all of Prince Edward Island consists of Permian sedimentary rock, deposited while sedimentation bypassed what is now Nova Scotia, which was being eroded and whittled down. Why is this interesting or even relevant? Reconstructing such large-scale processes helps us understand the evolution of the earth and its tectonic activity. These processes have not only contributed to what our landscape looks like, they also help us understand the occurrence of our own natural resources and those in other regions. Opening and closing of oceans and associated mountain building processes explain the occurrence of much of our mineral and fossil fuel occurrences and comparing these outcrops with other parts of the world, contributes to that understanding elsewhere. For example, the article by Leleu et al, cited below, was the result of a study that looked at the Wolfville Formation as an analogue to hydrocarbon bearing rocks in the subsurface of the North Sea. Minas Basin, Nova Scotia (images Google Earth). Left: overview image – the green arrow points to the location of Rainy Cove. Right: same image, zoomed in. The Rainy Cove outcrop runs more or less North-South. It’s early morning in this image because the cliff is in the shade. The tide is fairly high, because the tidal flats aren’t all the way exposed, but a portion of the rocky tidal flat is exposed, showing intricate structures in the exposed rocky beach. This week marks the 10-year anniversary of the Great Sumatra earthquake which triggered the devastating Indian Ocean Tsunami that killed a quarter million people. A rare and devastating event in itself, it was followed in March 2011 by an even larger earthquake and ditto tsunami in Japan, now known as the Tohoku event. Two-thirds of the world population live at or below sea level. Almost all tsunamis are generated by oceanic earthquakes and are therefore a serious risk in many parts of the world. People know that tsunamis are serious natural hazards (see my earlier post here on what makes a natural hazard). What makes them so dangerous is the relentless run-up of a massive wall of water that takes everything in its path. But how does that wall of water become so relentless and destructive? On the left hand side of the diagram are wind-generated waves. To the right are Tsunamis and Tides (in between are “Seiches”, which I won’t discuss: here is a good link). Both wind-generated waves and Tsunamis & Tides can have wave heights of more than ten meters (1,000 cm). 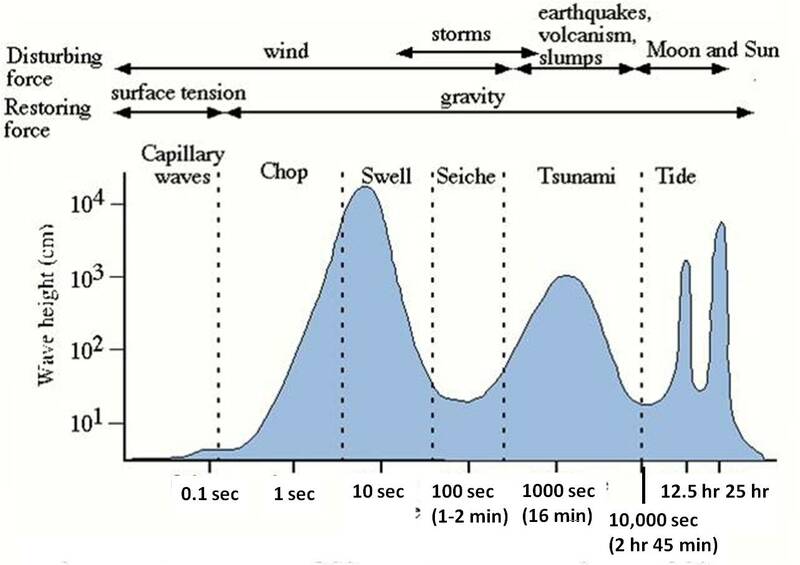 But wind-generated waves have fairly short wave periods, less than 100 seconds, whereas Tsunamis have wave periods anywhere from a few minutes to two hours. That means that the distance between two successive wave crests (the wavelength) of tsunamis is very long, much longer than for wind-driven waves. Tides, which are largely controlled by the gravitational effects of the Moon, have a wave period of twice 12.5 hours, because it takes the moon 25 hours to orbit around the earth. Now let’s look at waves from a different perspective. When a wave (energy) passes through a water body, the individual water particles make circular motions as shown in the image below, and this is what causes the wave, i.e. the energy, to travel. The image below shows how that looks in a so-called Deep-water Wave. A deep-water wave. Water particles move in circular fashion. The force that drives the wave is usually the wind. The wavelength is the distance between two successive wave crests. For a deep-water wave, the water depth is greater than half the wavelength. Below the water surface, the circular motion of the water particles decreases due to friction (they rub against each other). At a depth of half of the wave’s wavelength, the water particles no longer move. We call this depth ‘wave base‘. So the depth of the wave base varies with the height of the waves. Storm waves are higher than calm weather waves, and their corresponding wave base will be deeper than for calm weather conditions. Wind-driven waves in the open ocean can have wavelengths up to a few hundred meters. Therefore their wave base is always in the water column (it doesn’t hit bottom) because the open ocean is on average 4 km deep. From the wave’s perspective the water is always deep. That’s why these waves are called “Deep Water Waves”. Deep Water waves travel with a velocity that is proportional to their wavelength, and because their wavelength is at most a few hundred meters, they don’t travel very fast. They move unobstructed across major water bodies until they arrive in water depths that are shallower than half their wavelength. Then their character changes to that of a Shallow-water Wave. What is a Shallow-water Wave? A shallow water wave is one of which the wavelength is greater than 20 times the water depth. The average depth of the oceans is 4 km, so their wavelength can be 80 km or more! The speed of a shallow-water wave is proportional to the water depth and independent of its wavelength. Hence, in great water depths, they travel very fast. Tsunamis and tides are shallow-water waves. A tsunami typically has a speed of about 800 km/hr in the open ocean. But their wave height in the open ocean may not be more than 1 m (see for example this link). When a wind-driven deep-water wave approaches the shore, it becomes a shallow-water wave at some point. It starts to slow down due to friction against the bottom. But it doesn’t lose energy, at least not right away. What happens when a wave slows down but retains its energy? The wave height increases (this makes the surfers happy). At some point, the wave becomes higher than the water is deep (remember, we’re running up to shore). At that moment the wave becomes unstable and breaks (this makes the swimmers happy), and that’s when it loses energy quickly. The beach is formed in equilibrium with the average breaking wave height in a specific area (when the occasional exceptional storm hits the coast, the beach is not in equilibrium and the result is erosion). 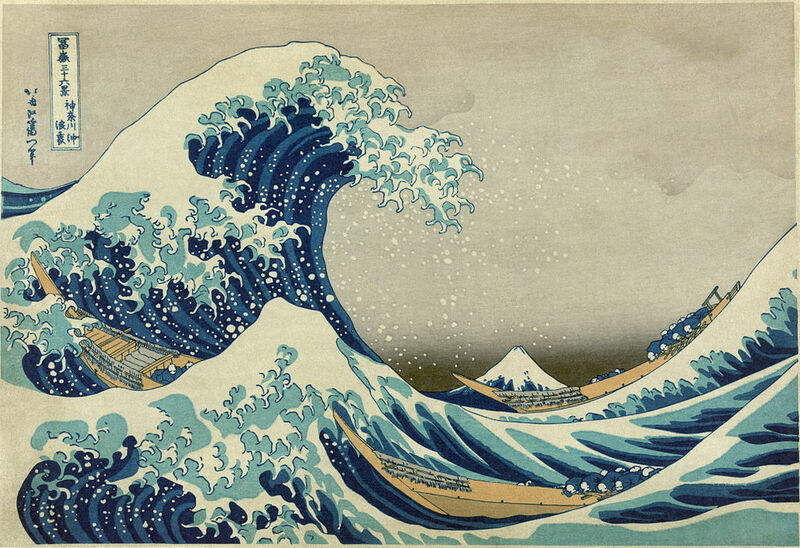 The shallow-water waves that are Tsunamis travel at velocities of hundreds of kilometers per hour. They have such speed that they won’t be slowed down by the regular beach, they are not in equilibrium with the existing coast. As they run up the shore and before they break, their height increases massively and they destroy everything in their path until their energy is finally lost. People are used to tides and tides can be predicted with great precision. For example, here in my back yard, in the Bay of Fundy, where the tides are higher than anywhere else in the world, high tide at Saint John occurs exactly 1 hour before high tide at Burntcoat Head, which is 180 km away across the water (see figure below). In other words: the-wave-that-is-the-tide travels at a speed of 180 kilometers per hour (yes, this creates potential for tidal power generation, about which I wrote an earlier post here). It runs up the coastal plain and submerges everything but because it does so twice every 25 hours, the shape of the coastline is in equilibrium with this phenomenon: it consists of vast expanses of tidal flats. Bay of Fundy, Canada. The distance from Saint John to Burntcoat Head is 180 km over the water. High tide in Saint John occurs 1 hour before high tide at Burntcoat Head. So a tsunami behaves exactly like the incoming high tide, with an even higher velocity. But because tsunamis happens to rarely, there are no tidal flats to indicate where you shouldn’t put your dwelling. In essence, people in tsunami-risk zones live in an overgrown and built-up ‘tsunami flat’. People will continue to live near the sea for many reasons. There is now a tsunami warning system for the Indian Ocean, but lives will still be lost the next time a Great Wave materializes.